I heard about this one in Entertainment Weekly, that there is possibly going to be a movie based on this triology or a TV show? As everyone is searching for the next Hunger Games, many YA trilogies are coming to the forefront, and Lauren Oliver’s seems like a natural fit to carry the torch. Adults may find some of the writing in Delirium to be tedious and sappy, but keep in mind you’re not reading Shakespeare. This is a light read, beach material for sure. 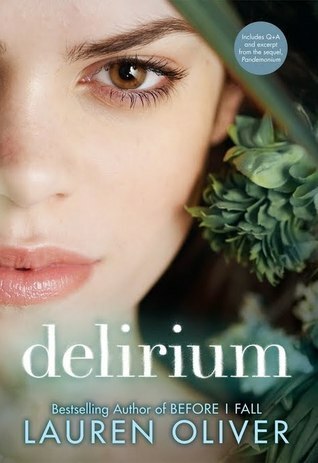 Focusing on Lena, a seventeen year old girl living in a dystopian society where love has been outlawed by the government, Delirium exposes us to the rules and dangers of having such emotions. Boys and girls are kept separated until they have a “procedure” at the age of eighteen to remove the “disease” of love from their brains. They are then matched with a mate, married off and live numbly ever after. As Lena approaches her eighteenth birthday, she is apprehensive of what her life will be like after the procedure. Her best friend, Hana (I immediately disliked this name, btw), is also nervous, but introduces Lena to the underground world of the “resistance” – those who fight against the government ban on love, who dodge the procedure, but who are left to the outskirts of society. Lena sees first-hand what happens to those who resist. And yet, when she meets Alex, she is drawn to him. I’ll probably read the next book in the series, if not all three. It’s not on my urgent MUST READ NOW list or anything like that; I’ll read it when I read it. I’ve heard good things about Before I Fall, another novel by Oliver, so I might check that one out sooner. Give this one a shot if you miss the Hunger Games and want to lose yourself in another dysfunctional society and get caught up in a love story that will jerk you along for a bumpy ride. Yep this was an ‘okay’ book for me too, and despite the cliff-hanger I haven’t gotten around to reading the next book yet but I do intend to. I’d heard rumours of a tv show as well, but nothing seems to have come of it yet. It could either be really great… or not so great. Depends on who gets a hold of it. 🙂 Cool review!